I am always experimenting with new workshops at the library. I love learning a now DIY project and passing it on to the kids and teen in my community – and they love it too! 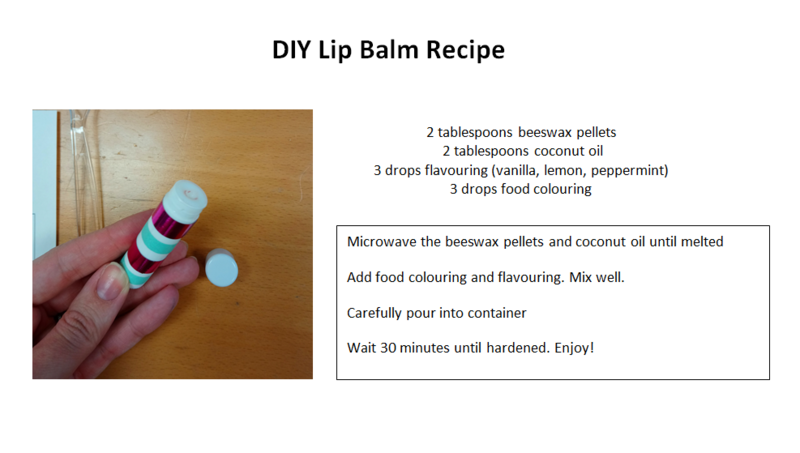 Lip Balm workshops are easy and effective. The coolest part is the customization, so make sure you have lots of flavouring options and colours to choose from. In a large glass bowl, microwave the coconut oil, beeswax, and optional coco butter until completely melted. Stir together. Place the large glass bowl into a larger bowl with hot water to replicate a double boiler. The hot water should maintain the temperature of the ingredients for long enough to complete the workshop. Meanwhile, each participant can choose a colour and a flavour and put two drops of each into their small cup. Instruct the participants to mix the ingredients together as quickly as possible. If the mixture cools it will be difficult to add into the container. They have about 1 minute of stirring time. Once the colour is mixed in, they can carefully pour the mixture into their lip balm containers. Funnels are recommended if doing this workshop with children. After 30 minutes, their lip balm should be hardened and ready to use! I highly recommend having a decoration table for kids to use after they have put the ingredients into the tube. Simple white paper sticker labels and markers were a hit – everyone could come up with a name for their lip balm. This is a very easy workshop to lead, but it’s super exciting for the participants. Just be aware that it is probably going to go a lot quicker than you think – especially if you are preheating the ingredients before the participants arrive. I did this workshop with tweens, but it would be great for teens or adults as well! Have you done a lip balm session at the library before? Share your questions, tips, and tricks below! Where did you get your beeswax pellets? I’m planning a similar program but I’m finding the beeswax very expensive.